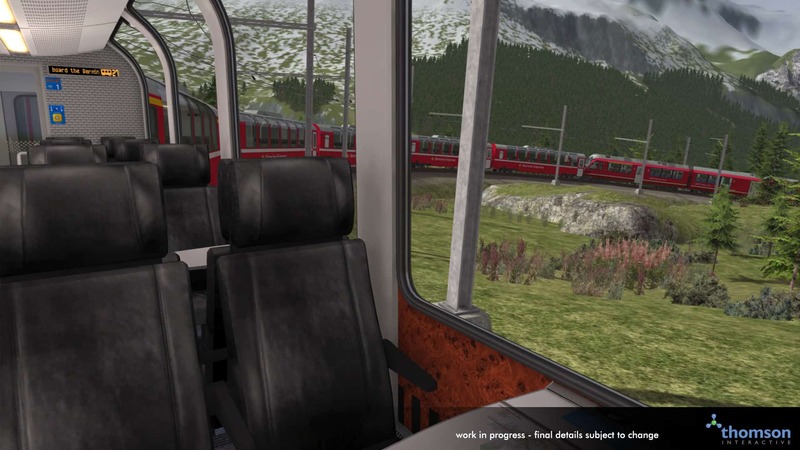 The next Swiss route from Thomson Interactive will bring to life the mind-blowing valleys and high-reaching rails of the historical Bernina Pass, from St. Moritz and Samadan to Poschiavo. 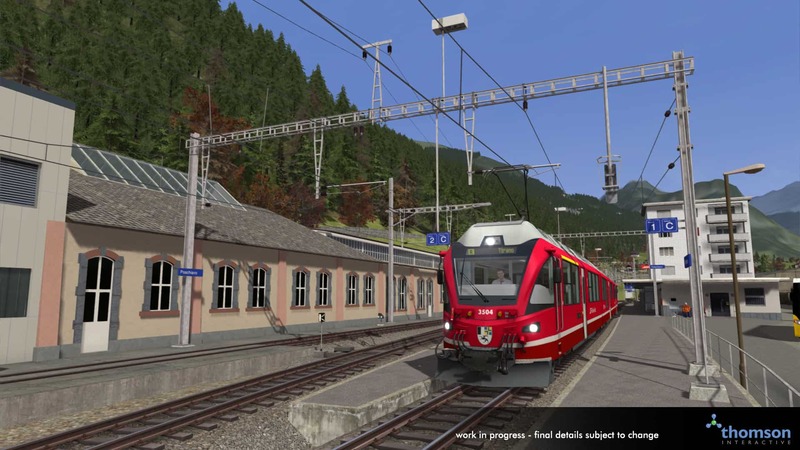 Following on from the incredibly popular Albula and Arosa Lines, Thomson Interactive are bringing more Alpine scenes to Train Simulator in the form of the famed Bernina Railway, and of course its iconic and panoramic “express” services – let’s take a look at the history of the line. In 1904, the revolutionary Albula Line opened to traffic, stretching to the spa resort of St. Moritz and ensuring the continuation of railway connections in eastern Switzerland. 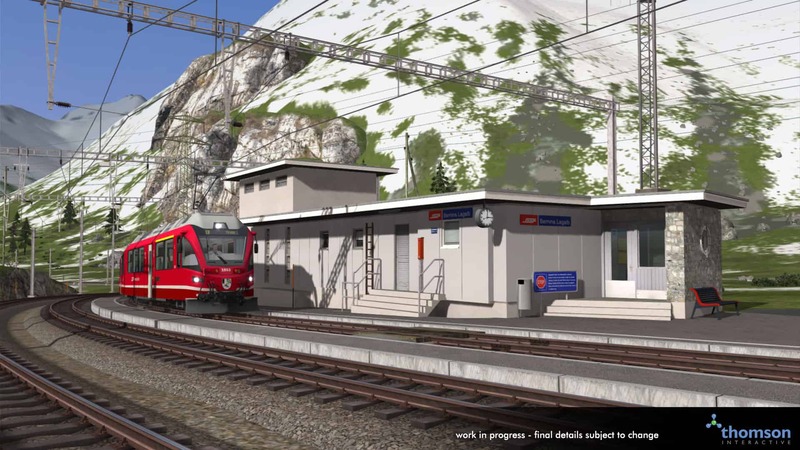 It would only be open for about a year before discussions for another railway were taking place; a line that heads due south through the Bernina Valley, climbing to 2,253 m (7,392 ft) before beginning the descent towards the Swiss-Italian border. The new route would be the most challenging yet, having to climb and fall within a set distance meant many breath-taking hairpin turns and some of the steepest gradients ever attempted by conventional rail were set to feature. The line opened in stages between 1908 and 1910 as an electric, single track railway, connecting Italy with Swiss railway network. Like the Albula Line, the new railway through the Bernina Pass was built with metre gauge track, however it was electrified with Direct Current (DC), rather than Alternating (AC), DC allows for better dynamic braking performance on severe or constant downhill grades (also notably done on the British Woodhead Line). This was essential to the Bernina Pass, as its difficult landscape meant gradients as steep as 7% were present throughout. Originally energised at 750V, this was upgraded to 1,000V in 1935. For the first few decades of its life, the Bernina Railway struggled to pay for itself after a costly construction, even tinkering on the bankruptcy line for some time. The line was rescued in 1943 following a takeover by the Rhaetian Railway (RhB), who upgraded the line quite substantially, including the re-model of the top of the pass, which was originally constructed for scenic purposes but was in avalanche danger zones. 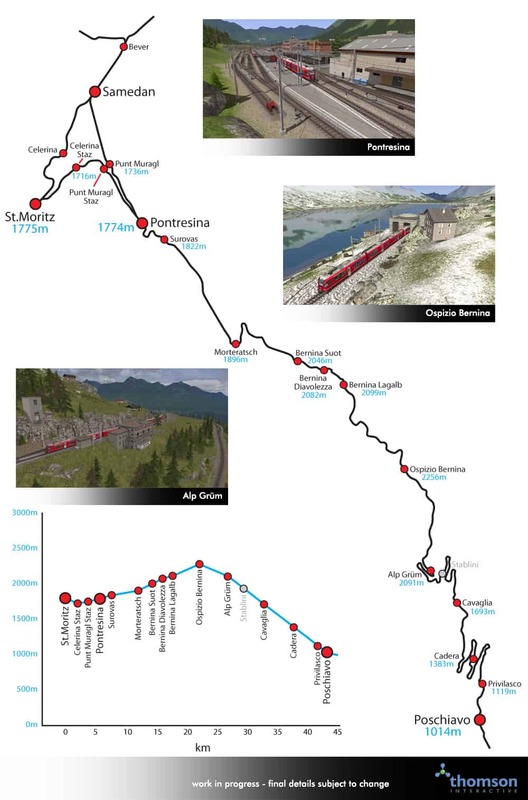 Since then, the line has established itself as a major tourist route for those who seek stunning views and Alpine resorts, and has become home to the “Bernina Express” (BEX) which connects Chur, Davos and St. Moritz to the Pass, complete with bespoke panoramic coaches to provide the best possible views. 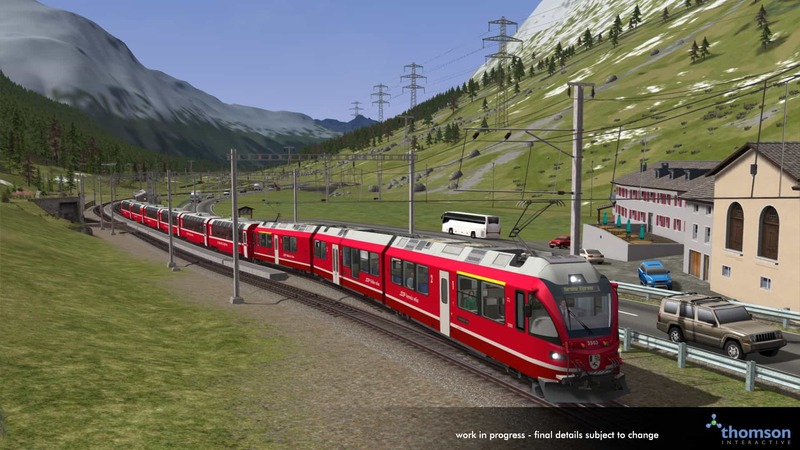 And soon, thanks to the efforts of Thomson Interactive, the almighty Bernina Pass from St. Moritz & Samedan to Poschavio will be coming to Train Simulator. Spanning approximately 49 km of Alpine track in total, the Bernina Pass route will offer exquisite detail, captivating views and immersive features. 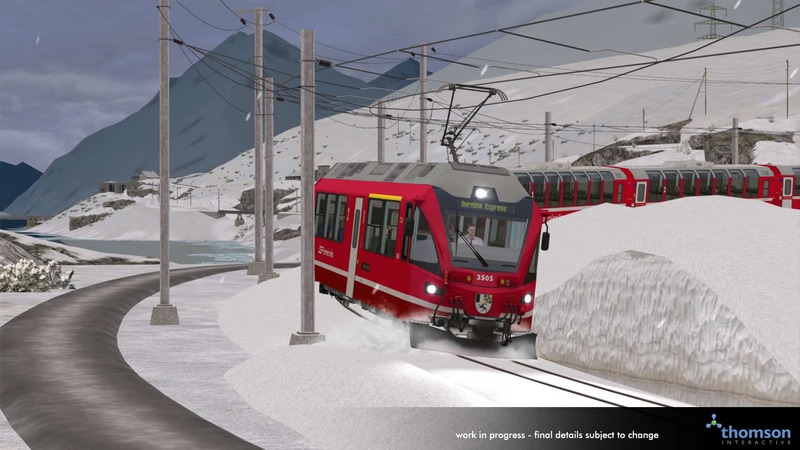 Every season has been represented to exact detail, complete with increasing snow levels as you move between Autumn and Winter, the latter of which is the most visually stunning, complete with cutaway snow drifts, snow particle effects off the train’s snow ploughs, and even the lake edges of Lago Bianco partially freeze over. As the Pass is electrified to 1000V DC, but still connects to the 11kV AC network of the RhB, dual voltage traction has become a regular sight, including the ABe 8/12 Allegra which comes into its own on the BEX. Also included will be the all-new Ap (first class), Bp (second class), Api (first class accessible toilet) and Bps (second class catering service) panoramic coaches of the BEX, plus Lb-v and Sp-w freight wagons. 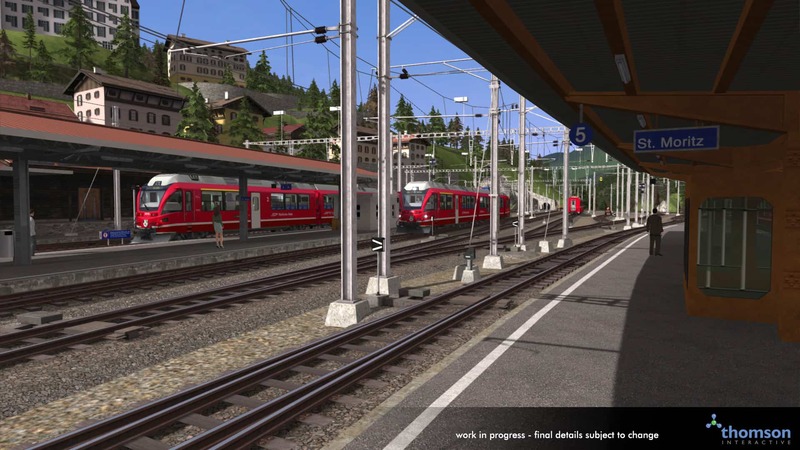 Please see below to get your first look at Thomson Interactive’s latest masterpiece, and watch this space as we will soon bring you more on the Bernina Pass: St. Moritz and Samadan to Poschiavo route, which is coming to Train Simulator. 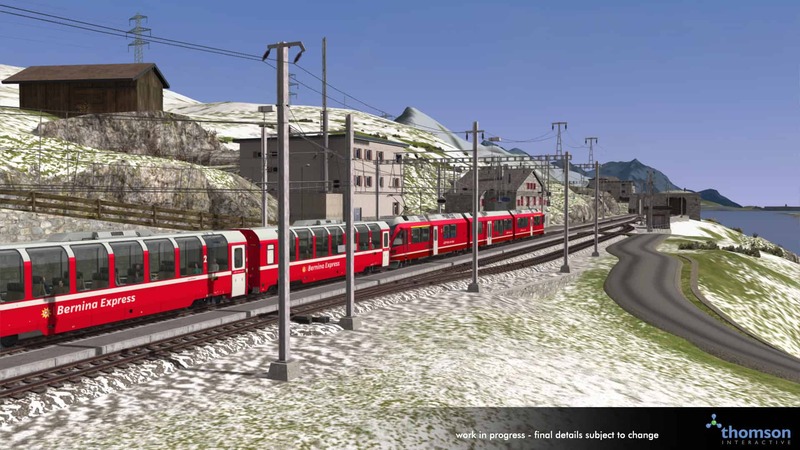 A station familiar to Albula Line owners, St. Moritz marks the start of the Bernina Pass, with the line heading promptly south towards the glacial Bernina Valley. 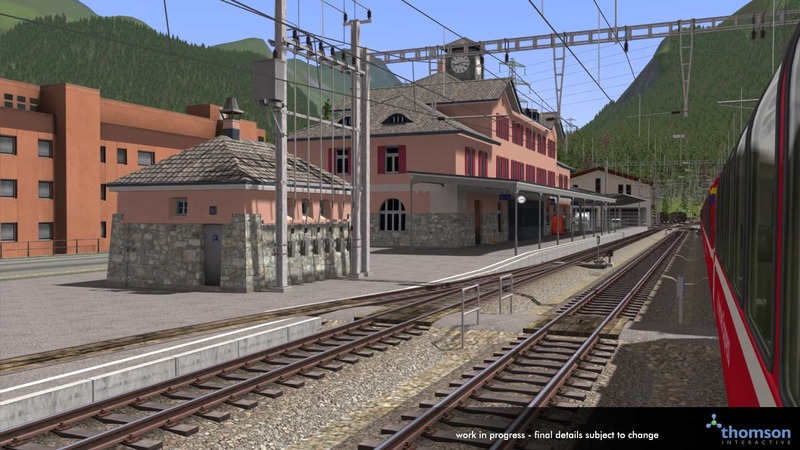 Pontresina station is where the connecting line from Samedan merges onto the Bernina Pass, and trains that take this route must switch from 11kV AC overhead to 1000V DC overhead before continuing (above). Facing the other direction, we see the Alps in full view, making for a captivating backdrop for the unique station building (below). RhB’s panoramic coaches make for an unforgettable experience, as the Bernina Express tackles with astonishing 7% gradients throughout, combine that with the incredible hairpin turns which are present and seeing the front of your own train is a regular and breath-taking sight. To take advantage of the views, Passenger Mode scenarios will feature so you can sit back and enjoy. Bernina Suot sits at the base of two snow-capped peaks, just over 2 km above sea level. The different pantograph configuration on the Allegra is also notable here, those mounted behind the cab are for 1000V DC power, and the one on the centre vehicle is for the more conventional 11kV AC system. Ospizio Bernina marks the peak of the Bernina Pass at 2,256 m of elevation, the weather here is the most extreme along the route, with snowfall present as early as the Autumn (above), meaning Winter is nothing short of a wonderland - albeit, a wonderland which the Allegra has to cut its way through (below). 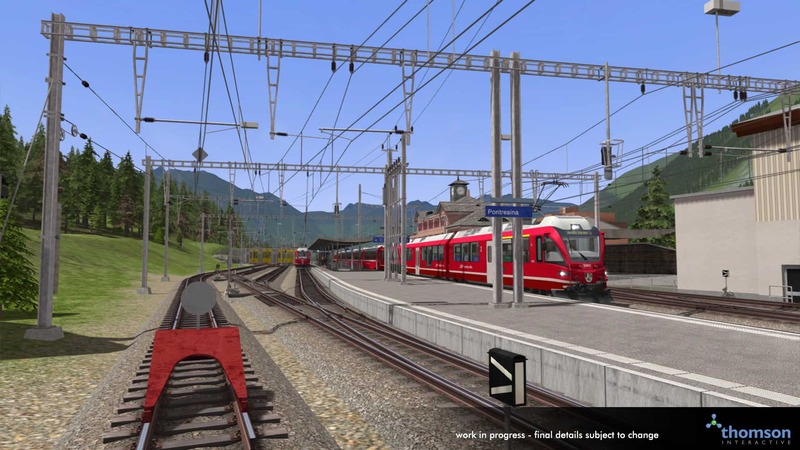 After a long climb back down the mountains, the line reaches Poschiavo and the end of our journey today, but we’ll be taking many more as time goes on, and soon you’ll be traversing this landscape for yourself, as the Bernina Pass: St. Mortiz and Samedan to Poschiavo route is coming to Train Simulator.